The Bengals finished the 2015 regular season with an AFC best 12-4 record (tied with Broncos and Patriots). The AFC North Champion lost to the Wildcard Steelers in the first round 18-16. The Bengals have been in the playoffs every year since 2011 but have failed to win a playoff game. Cincinnati competes in the AFC North with the Pittsburgh Steelers, Cleveland Browns and the Baltimore Ravens. The Bengals will play a week 10 Monday Night Football game at the New York Giants. They also play a Thursday Night game at home verses the Miami Dolphins. 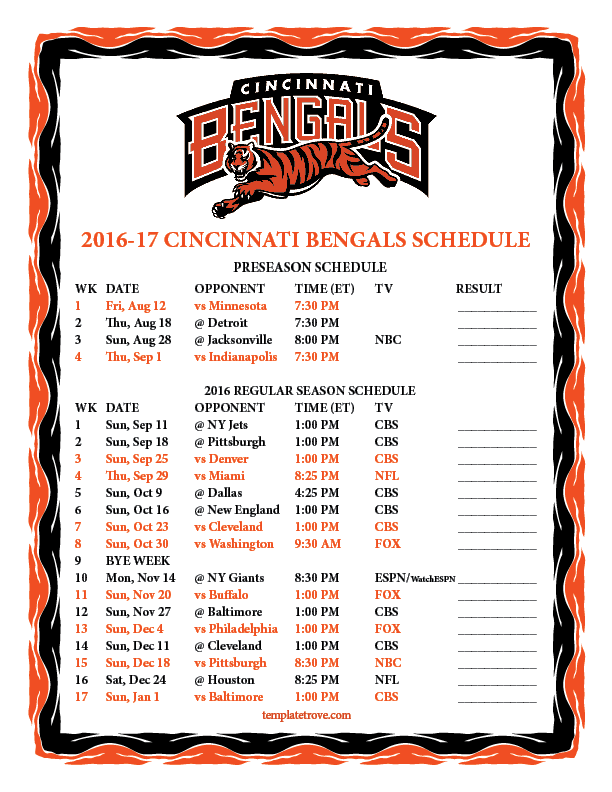 A trip to London's Wimbley Stadium in a week 8 battle with the Washington Redskins and week 15 Sunday night game at home against the Steelers highlight the Bengals schedule.